Anyone who has done Krav Maga, even for just a short period of time, have realized that we are vulnerable to violent attacks from bad people if we are not vigilant and alert to our surroundings. Bad people want something we have; our resources, such as money and valuable things or even our life, and we sure want to stop them from getting them. This knowledge is perhaps one of the biggest reasons for anyone to start doing Krav Maga. Based on this realization, we train our body to become stronger and familiar with movements, and we train our mind to function under stress and make the right decisions. We do this in a dynamic environment against an empty-handed or armed assailant, with returning attackers, multiple attackers, in the dark, in a crowd, getting to safety, etc. Perhaps one of the most challenging dynamic environments would be an “individual actively engaged in killing or attempting to kill people in a populated area”, or Active Shooter, as defined by the Federal Bureau of Investigation (FBI). Sadly, the phenomenon of an active shooter is a growing concern, not just for elementary schools or social service facilities in the United States, but also for shopping malls in Kenya, museums and Airports in Belgium, and café’s and concert halls like we saw in Paris in November 2015. Yes, some of these examples are terrorism. However, if we look at the act itself, it is also an active shooter incident, regardless of the political stance and the perpetrator(s) goals. For the most part, we live in a society where our safety and security is in the hands of our men and women in law enforcement and our security services. Law enforcement officers receive the distress call, and they run towards the threat and deal with the problem. However, an important discrepancy needs to be talked about, and there is an elephant in the room and it is called – time. In other words, the 10 to 15 minutes from when an incidents start until it’s finished, you are alone in a hostile situation where seconds matter. What do you do? On April 16, 2007, a 23-year-old student at Virginia Tech, Seung-Hui Cho, shot and killed 32 people, shot and wounded 17 others (6 more were injured as they tried to escape from the gunman), before he killed himself. Cho first killed two students in one part of the campus, then he went home, to the post office and then to another part of the campus to continue his killing spree. Cho then entered the Norris Hall building, barricading the doors and walked up and down the corridor of a floor to observe which were used and not. The police was notified only two-three minutes after the first shots were fired, and since they were already on campus, they arrived at the scene relatively quick. However, Cho had barricaded the doors and put up signs that said the doors were booby-trapped. The police made their entry to the premises and saw Cho in the hallway. Cho ran into room 211 and shot himself in the head. The incident was over in less than 12 minutes, with five faculty members and 27 students dead, and 17 injured. IT HAPPENS. This may sound trivial but think about it. If you hear gunshots or explosions at a time and place where this is out of place, you should use the “sneakers-defense” and run away. If you cannot run away, you should look for cover, not just concealment, to shield yourself from the incident. Barricading a door, as we have seen above makes sense. Indeed, due to incidents like Virginia Tech, the FBI and Department of Homeland Security (DHS) in the United States have implemented a simple, yet effective acronym Run, Hide, Fight! If a safe escape route is available to you, run to a safe place. Help others to get out! If it is not possible to get out safely, or you are not sure it is safe, find a place to hide. Lock the door, barricade it and silence your cell phone. Know where you are and convey this to the emergency operators so they can pinpoint your location. If there is no other option(! ), fight the attacker aggressively, using whatever weapons are available (for example, a pen, fire extinguisher, chair, a table, or hot coffee). Fight (Krav Maga) if you absolutely have to! For the most part, Krav Maga teaches us self-defense and how to protect ourselves and those we care for. A couple of weeks ago, Eyal Yanilov came to our club in Norway as part of our Instructor Update (IU), where the topic of the weekend was “active shooter”. Eyal brought us through several techniques and tactics over the course of three days, where the focus was partly self-defense and partly how to attack an attacker. The weekend also contained theoretical aspects of the “run, hide, fight” concept, presented by me, as a background to the theme of the weekend. We felt that this was an important aspect of our training and also important knowledge to pass on to our students. In essence, the techniques which Eyal presented, directed the trainees to attack the active shooter in different ways, approaching from different directions and ranges, using various strikes and kicks, how to control different types of weapons in an assailant’s hands, as well as tackles and throwing/takedowns techniques. The knowledge and techniques given to us by Eyal came from incidents including hostage taking, which at a later stage turned into the shooting of those victims, in Israel in the early 1970’s, as well as later incidents around the world. 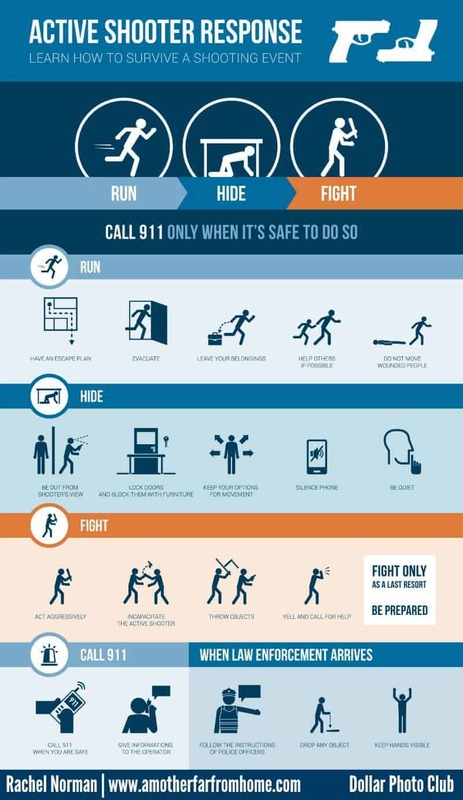 For more reading material, I you may want to read this blog post: “what to do in an active shooter incident” by Brett and Kate McKay, and look at this infographic made by Rachel in her blog post “How to Protect Your Children in an Active Shooter Situation”. Freddy is an E1, KMG instructor in Norway, and part of the national team of instructors. Freddy has an MA in counter-terrorism from the University of St Andrews, MA in “Intelligence & International Security” from King’s College London, and worked in threat analysis and close protection for many years.